Do you suspect something’s wrong with your computer? Here are the top warning signs of a malware infection. Malware viruses are such a frequent news headline that most of us are aware of the damage they can do to businesses if their security is compromised. And yet most of us have suffered some kind of malware infection at some point in our careers. If we’re fortunate, the virus has been a nuisance more than anything, but malware has the potential to compromise businesses and any sensitive information they may be responsible for. Protecting yourself and your system is key. 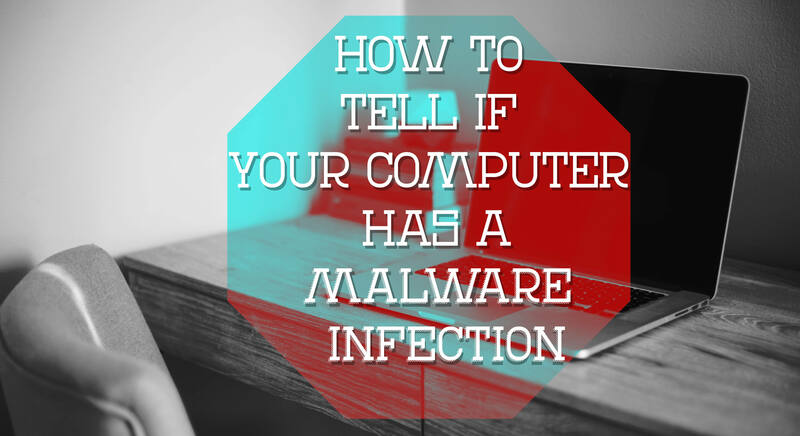 But how do you know if you have a malware infection? Here are some of the top warning signs. 1. Your computer has noticeably slowed down, freezes, or crashes frequently. For some computers, this is merely a sign of old age. But many times, a slow system, or one that freezes or crashes frequently, is an indication of a malware infection. Computer viruses usually run in the background on your system, interfering with other programs and eating up your processing power. If you’re noticing this problem—especially on a new computer—it’s time to have your computer inspected. 2. You’re locked out from logging on. Recent ransomware headlines have made most users familiar with ransomware. Most ransomware programs lock you out of your own system, or deny access to certain files until a fee has been paid. Even if you don’t see a ransom notice, a sudden inability to log on to your computer could be due to a malware infection. 3. Unusual error messages keep appearing. Many viruses will send error messages as a way of prompting an unsuspicious user to grant further system permissions or authorize more downloads. These messages will try to mimic your computer’s error messages, but there will often be something off in the styling of the message box or the wording of the message. If you don’t recognize the message, or if it seems strange to you, try Googling for the exact wording of the message to see if it is associated with any malware. Even if you can’t find anything, a mysterious, reoccurring error message is a good reason to take your computer to a specialist. 4. Your tasks are interrupted by pop-ups. Similarly, many computer viruses create annoying pop-ups that interrupt you while you work with alarming messages or advertisements. These messages aren’t just irritating—they’re an indication of a virus on your machine. 5. Your browser homepage has changed without your input. Some viruses infect your web browser, inserting themselves onto the pages you visit and changing your settings without your approval. If you notice suspicious browser behavior—such as your homepage being set to a different website, a new extension appearing next to your search bar, or new bookmarks added to your browser menu, that could be a warning sign of something gone wrong. 6. Contacts are receiving mysterious messages from you. Viruses are always looking for ways to spread, and one of the main ways they do this is through your contacts. If your email or social media contacts are receiving strange messages from you, it could be a virus on your computer trying to spread. 7. Icons or programs you don’t recognize have appeared on your desktop. Many malware viruses will install some sort of program on your computer that may pass itself off as legitimate. It may have a harmless-looking name and an icon, but you won’t have any idea where it came from. If you’re noticing strange programs appearing mysteriously on your computer without your authorization could be a sign of a computer virus at work. 8. Your computer restarts itself, even when it’s not performing routine updates. Many computers will automatically restart after a system update, although they will usually warn you before they do so. But if your computer spontaneously shuts down and restarts itself, it could be due to a malware virus. If you notices this happening repeatedly and without warning, talk to your system administrator or an IT specialist. 9. Your antivirus software repeatedly tells you that it has been disabled. Many clever malware viruses have self-defense mechanisms in place to prevent themselves from being quarantined or removed. One mechanism is to disable any antivirus programs that run on the computer. Hopefully, your antivirus software will warn you if it has been disabled. If you see such a warning, especially after you’ve re-activated your software, that’s a sure sign that something is wreaking havoc with your system. 10. Your system tools have been disabled. Another common defense mechanism for many viruses is to lock a user out of their control panel. This prevents many users from being able to check the system settings that would show them what’s wrong with their computer. If you go to check your control panel and receive a message saying that only administrators are allowed access, that’s another possible sign that you have a malware infection. If there are no signs, does that mean you’re not infected? You’re not experiencing any of the warning signs. Does that mean your computer is safe? Unfortunately, it doesn’t. Many viruses go out of their way to avoid detection. They may even remove other viruses to ensure they don’t blow their cover. The longer these viruses remain on your system, the more information they’re able to gather off your computer—and the more dangerous they become. That means that, even if nothing seems wrong, you should still run regular check on your computer and invest in antivirus protection. Keep your computer up to date, especially with security updates, and be wary of suspicious websites, emails, or advertisements online that might trigger a malware download. You may also want to take steps to protect your business by investing in monitoring services. With an IT team on the job to help detect possible system abnormalities, you’re more likely to nip a virus in the bud—before it can spread to the rest of your system and cause ongoing damage.